The oceanfront Grand Turk Masonic Lodge. The old Masonic Lodge on Front Street, Cockburn Town. 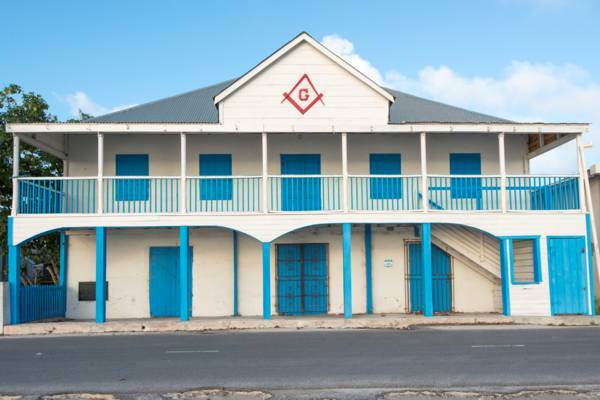 The Grand Turk Masonic Lodge N647 was opened in 1855 by the first president of the Turks and Caicos Islands, Mr. Fredrick Forth. Mr. Forth was a member and the Lodge was originally called the Turks Islands Forth Lodge. The Grand Turk Masonic Lodge is a chapter of the United Grand Lodge of England, and falls under the purview of the District Grand Lodge of the Bahamas and Turks. Although this Grand Lodge doesn’t include “Caicos” in its title, it supervises all lodges (3) in the Turks and Caicos Islands. Meetings at the lodge are closed to the public, although Freemasons who are members of a chapter in other countries may ask to attend meetings. There is the affiliated Caicos Islands Lodge, which meets at the Regent Village on Providenciales. The Freemason's Lodge is located on Front Street in Cockburn Town. Members of the lodge meet on the first Wednesday of every month. Frederick Henry Alexander Forth, the lodge's founder, was the first President of the Turks and Caicos Islands (or more accurately Council President). This was a short-lived post from 1848 to 1874. Afterwards, the duties of the president were taken over by the Governor of Jamaica, and after Jamaica's independence, the Governor of the Bahamas. The lodge is subordinate to the United Grand Lodge of England (UGLE), which was formed by descent from the first Grand Lodge (founded in 1717). Due to the income from the sea salt industry, the British and Bermudian colonial buildings on the islands of Grand Turk, South Caicos and Salt Cay tend to be the best remaining structures from the periods of early Turks and Caicos history. The late 1700s and early 1800s cotton and sisal plantations on the larger Caicos Islands initially thrived, yet when the industries collapsed, the agricultural attempts were largely abandoned. The Grand Turk Masonic Lodge is a prime example of the continuing repairs and renovations seen on the salt islands buildings. The original dimensional lumber roof has been replaced by more-recent tongue and grove boards and corrugated metal, the doors and windows have been replaced, and electrical utilities have been installed. As was the case with many of the important buildings at the time, hand-cut limestone blocks, sourced either locally or from Bermuda, forms the main structure of the lodge. Last reviewed by an editor on 11 April 2017.